Enter this giveaway for a chance to win a book necklace made by Goodnight Boutique and a book of choice worth $12. Good luck! I have a lot of bookmarks that I love. My favorite accessory is an author pen. I use it every day! I love to collect bookmarks, and I also love tote bags, they come in handy for trips to the library! Buttons are cute too! I have mainly collected bookmarks. My favorite bookish accessories are the few books that came with me in the move a few years ago because I prefer paperback to digital which is what I've been getting lately. I own a Desperation Recycled Book Purse, Book necklace jewelry miniature book and more but my favorite is Wizard School Metal Art Bookends. I have several signed bookmarks and I have a key chain made for me about an author and her books, which is my all time favorite item. I love to collect bookmarks. I've got a couple of gorgeous umbrellas with texts and quotes from the classics on them that I hate to get wet! I have a really nice beaded bookmark and silver key necklace that says Time to Read on the clock's face that I love! I have bookmarks and my favorite is a beautiful fairy one. I have a favourite bookmark of an anime character that my daughter drew for me. I only have some bookmarks but would love this. I also have many, many bookmarks. I have some handmade book covers too. Thanks for the giveawy chance. I have a lot of bookmarks, but I usually give those to my daughter because she loves them! My favorite bookish items are pens and totes because I use them so much. 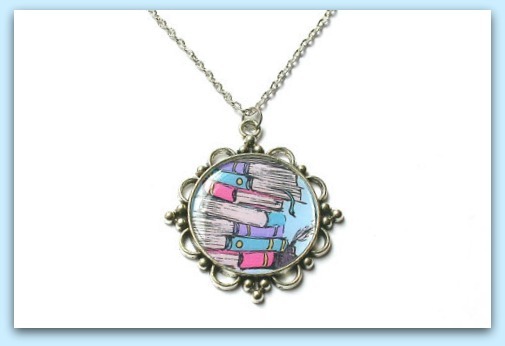 Gorgeous necklace, as I love to read!! I don't know if this counts but my favorite bookish accessory is my bookshelf. It was the first piece of furniture I picked out. I have a necklasse from oe of the CoHo's series and I love it. I was given a weighted bookmark some time ago and I love it. It holds the pages open nicely when I want to be hands free. It is starting to look rather worn now so I may have to source a replacement soon. I have a few book markers and a few necklaces a about 3 key chains and a lot of pins but my favorite are the cool made book markers. I have quite a few book themed necklaces! I love them! My favortes are 2 signed bookmarks for Hidden Huntress and Warrior Witch by Danielle L. Jensen. and a book of my choice worth $12. The kind of bookish accessories i own are a mug and Key chain. The Key chain with a book on it is my favourite. my fave is my Charlotte's Web necklace but I would love to have a fun scarf or leggins with a bookish theme.